Known as the Water-Horse or Horse-Eel, it was a favorite art subject in Greco-Roman times, especially in Roman baths, where it is frequently found depicted in mosaic. 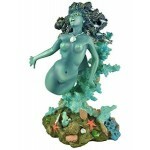 Lovely statue by artist Oberon Zell is 7 3/4 inches high, cast resin and hand finished. Wood base shown not included. Please note this is a hand painted item - colors may vary slightly from the example photographed. Item Number: MT-SEAHORSE | Approximate Size (Inches): 5.00 wide x 7.00 deep x 7.75 high | Approximate Shipping Weight: 4.00 lbs.